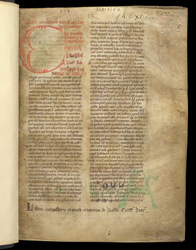 This manuscript was written in at least three different stages: the oldest part is early 12th century; later in the century the second part was written straight on from the first; and three further texts in French were added in the 13th century, the first of which is Wace's 'Roman de Rou': a chronicle of the dukes of Normandy which contains a famous description of the Battle of Hastings. This manuscript was owned by Battle Abbey, built at the site of the battle, about seven miles from the town of Hastings. The manuscript has an ownership inscription and press-mark of the Abbey. In the lower margin of the page is the ownership inscription of the monastery of St. Martin, Battle, in the diocese of Chichester: 'Liber monasterii Sancti Martini de Bello Cicestrensis diocesis'. Towards the top right corner are the letters 'CQ' in red, the normal form of Battle Abbey press-mark. In the middle of the upper margin is a monogram 'HR' of Henry VII or VIII, which seems only to be found in volumes which, like this one, contains texts in French.